The 57th volume of South Africa's version of Wisden is again excellently presented and covers in excellent detail all facets of South Africa's 2010 international and domestic season. This 14th edition sponsored by Mutual & Federal is the company's last and fulsome praise is paid to them by the editor, Colin Bryden. It will be interesting to see how the five cricketers of the year fare in 2011 and already three of them, Ryan McLaren, Alviro Petersen and Juan Theron, have represented South Africa in international cricket. McLaren and Petersen will also be known to English county cricketer watchers. Excellent coverage is given to South Africa in the International Cricket, Senior Domestic Cricket and Other Cricket which includes National Club Championships, Women's cricket, Under-19, 17, 15 and 13 age levels and cricket weeks for juniors. There is also a thorough section on South African and an Obituaries section and the book is well illustrated with some excellent photographs. The statistics throughout the book are, as always, excellently laid out by Andrew Samson and the reader will find First-Class Career Records, Limited Over Career Records, South African International and First-Class Records as well as highlights of the previous season. All are expertly presented in this impressive review of the season. 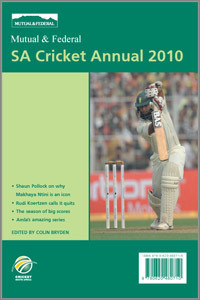 The South African Cricket Annual 2010 is a mine of information and is an invaluable book for any cricket lover and South African supporter with, not only statistics for the country and players, but also for the reports on matches, brief player career summaries and the many scorecards excellently formatted by Ros Brodie.